… in earnest. Before today, it was just ramping up. Now, we are moving into the period of time where I will be harvesting, roasting, freezing, canning and processing to fill the freezer for winter. 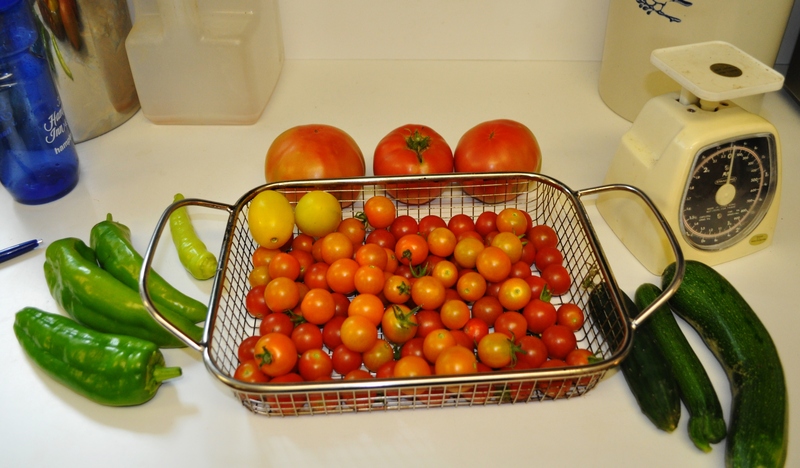 Today’s community garden harvest. Minus the chard and the chives that I harvested to donate to the Food Bank. That was part of the 131 pounds we collected this morning. The above food is just from my plot. The tomatoes! The first Big Boys. All in all, fifty ounces of tomatoes. Ten ounces of sungold and eighteen of supersweet 100s alone. I also got my first three cubanelle peppers. With the weather changing to sunny and hot, I hope to see the peppers kicking in. I did make the pesto with all the basil. Two cups of a mix of lemon and African blue basil. One cup of a mix of toasted pecans and almonds. 2/3 cup grated Parmigiano Reggiano. Salt. Pepper. Olive oil. 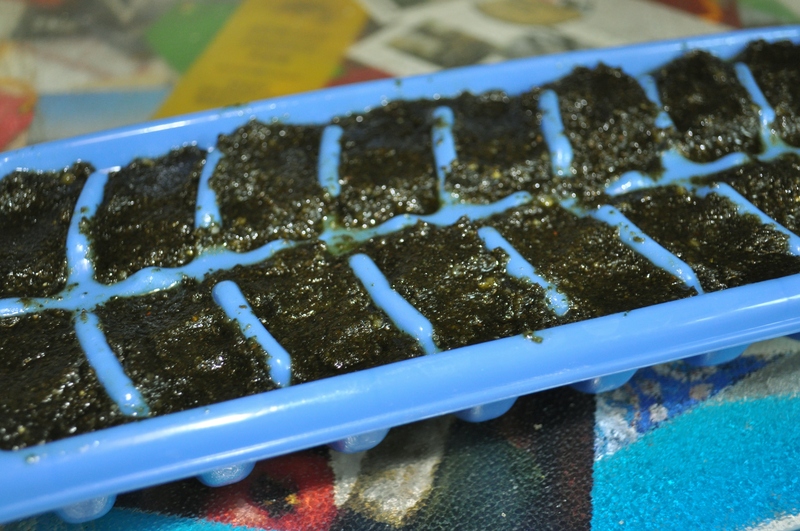 I got one whole ice cube tray plus about six ounces in an eight ounce container. All in the freezer now. In the dead of winter, nothing screams summer like pesto. As for those Big Boys! They went into today’s lunch. 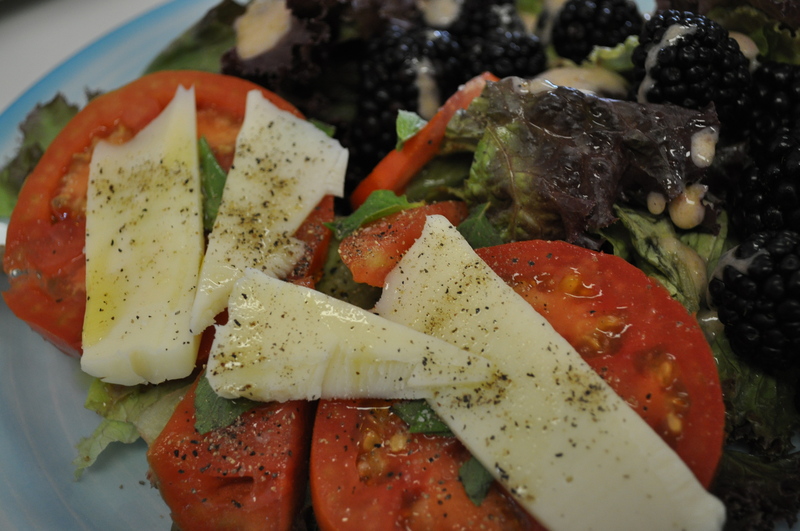 A small side Caprese salad. With greens and blackberries there, too. The next few weeks will see a mess in my kitchen. Canning jars. Food Saver bags. Vegetables. Fruit. Herbs. My favorite time in the summer. When it all gets enjoyed or saved for the winter. 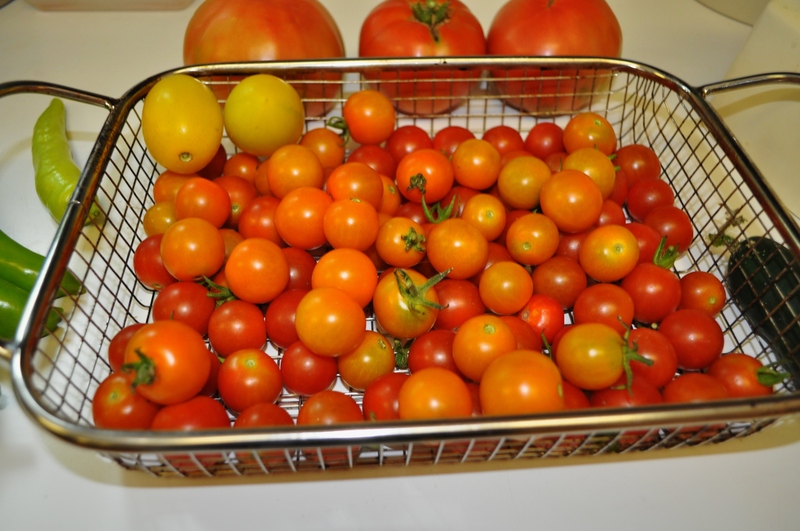 Posted in Food, Gardening, Hobbies, Real Food and tagged cooking, Food, foodie, gardening, real food, tomatoes. Bookmark the permalink. Really impressive! I’m jealous of the pesto!